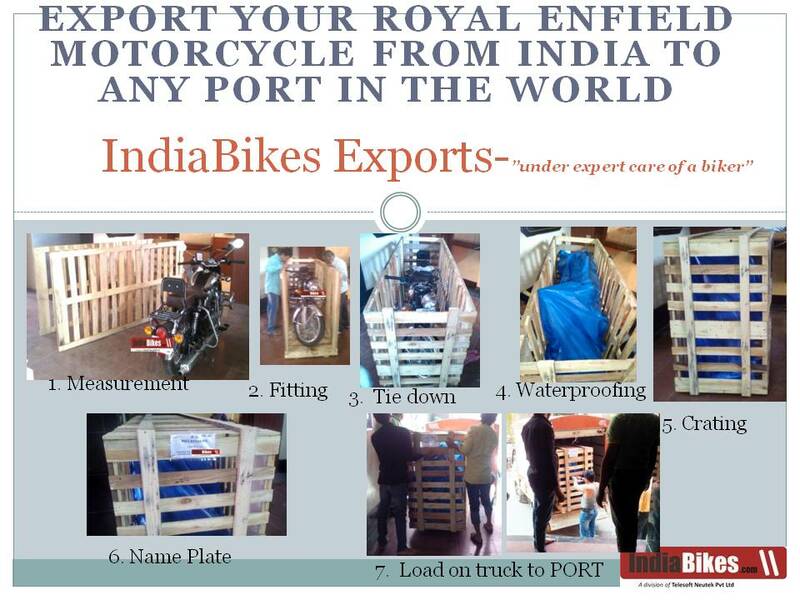 In shipping & Export Service - We can ship your motorcycle* to you to any port in the world. We also undertake Carnet import and export. UK: Thamesport, Felixstowe, South Hampton. US: LA, SF, New York, Norfolk (North Carolina). Asia: Iran (Bander Abbas), Bangkok, Phillipines, Singapore, Malta, Sri Lanka, Katmandu, Male. We are only motorcycle exporters and have expertise on this matter for over two decades. We use first class marine lines. Quick export since we take first class shipper service. Internet tracking link for ships voyage. We also handle your paperwork for de-registration & NOC if you like so your experience is single vendor and seamless. Individual crates, individual crate fumigation thereby helping you to clear your cargo earlier at your port. We do not dismantle the motorcycle to save on wood and freight in order for you to roll on and off the crate easily. Thousands of happy customers all over the globe for the last 2 decades. Division of Telesoft Neutek Pvt Ltd.